Mar 15: Last Panda Update before integrating "gradual" rollouts. July 19: The Knowledge Graph Expansion. Google Panda - filters out low quality websites & content throughout the web. These sites may then be either dropped in rankings, or in plenty of cases de-indexed from search altogether. A large portion of sites that Google has clearly targeted for index removal have been worthless directory type sites, with no content value of their own. As well as link farms, hacked forums and other massive link schemes, such as free article submission sites with mostly regurgitated content. Countless billions of worthless backlinks are thus naturally eliminated as well. Google Penguin - mainly targets spamdexing & all manner of link schemes. Of course this would have a big effect on PR, due not only to removal of link schemes, but also to rank reduction penalties applied to toxic links originating from those sites that were formerly passing PR. The Knowledge Graph Expansion & Semantic Search - surface the most relevant & useful content. These are fabulous & interesting topics in themselves, but suffice it to say their affect is, when good content moves up... bad content falls! Google Hummingbird - is about semantic search, understanding the meaning of content, rather than just keywords. It is said to have involved rewriting much of the core Google algorithm for increased semantic understanding, increasing search's ability to understand phrases, better process social signals & other benefits. Of course, the better search understands, the better it can process & filter out irrelevant content as well. Ultimately, all these improvements help make the Google index cleaner, thus increasing the algorithms ability to process pages, content, backlinks & by way of extension PageRank, more efficiently & effectively. A lot of SEO's who have been working on Penguin recovery for websites, sorting through thousands of worthless links for removal & submission to disavow, know exactly what I'm talking about. We clearly see the large & increased quantity of websites that have been removed from Google's index & others that have PageRank almost completely eliminated, both of these being good indicators of harmful links needing to be disavowed. I believe the direction that Google would like to go with the visible PR, is to show the Internet at large, Google's opinion about how reputable a page is. If that sounds totally crazy, those are actually Matt Cutts own words as you can see below. But to do that, PageRank needs to prove itself once again, by showing the Interverse how much smarter & cleaner it has become. Because the problem has not been with the PR algorithm itself, but with the polluting of it by link schemes & all manner of blackhat, grey hat, straw hat SEO. For more on this see my, Balance Returns to PageRank. Avoid The Dark Side. Indulge me for a moment while I go off base here with some exploratory theories & analysis that make good sense to me, but for which there are insufficient specifics to reference here. For analytical purposes I believe these ideas to be most intriguing & may help explain some of the anomalies we are seeing. The reason we haven’t seen a fresh PageRank update recently is because the PageRank pipeline broke, so while the PageRank data internally continues to update as it should, webmasters hoping to get a fresh look at PageRank data are out of luck. Did someone just say, the "pipeline broke?" Why don't they just run to RadioShack & get another one? Does this mean a network broke, a data center, or could it be operating system related? 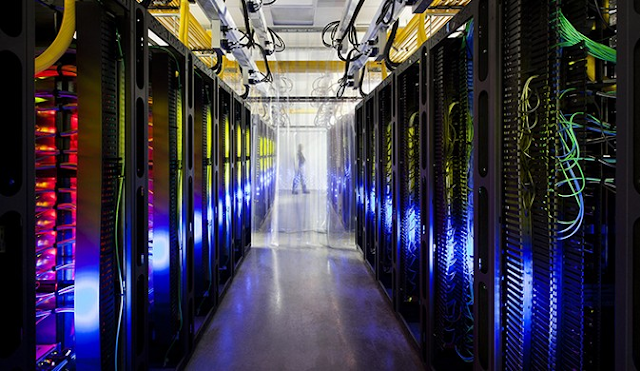 By the way, check out Google's top secret data center. Looks like someone left the Christmas lights on. Take a rare Street Map view in Google's secret data center & see an infiltrator from my Return of the PageRank story there. OK, so most people wouldn't even question this, but my mind had been ticking on what he could possibly be talking about. Then after the latest update I had an idea. What if it's not actually "broke," but the PR Toolbar algorithm which operates on a kind of logarithmic scale, just needs an update. While looking for a clear explanation of the PR Toolbar's logarithmic scale, I found the following most insightful article, The Google Pagerank Algorithm and How It Works - Whitepaper, by Ian Rogers. Whoa!... just lost half of my readers there when I said whitepaper. LOL. This one's actually a lot clearer & I'll pick out the best points for explanation. How Can You Discover a Page’s PageRank? Although commonly referred to as PageRank, and even labeled as such, the PageRank value provided by PageRank tools and services is not the page’s actual PageRank. It’s simply a number indicating the approximate position of the page on the PageRank range. Therefore, pages never have a PageRank of 0, even though most pages show 0 on the toolbar, and a page with a rank of, say, 2 might actually have a PageRank of 25 or 100. The true PageRank scale is probably a logarithmic scale. Thus, the distance between PageRank 5 and 6 is much greater than the difference between 2 and 3. The consensus of opinion among people who like to obsess over such things is that PageRank is a logarithmic scale with a base of around 5 or 6; some people believe it’s more likely base 8, or perhaps higher. Suppose for a moment that the base is actually 5. That means that a page with a PageRank of 0 shown on the toolbar may have an actual PageRank somewhere between a fraction of 1 and just under 5. If the PageRank shown is 1, the page may have a rank between 5 and just under 25; if 2 is shown, the number may be between 25 and just under 125, and so on. A page with a rank of 9 or 10 shown on the toolbar most likely has a true PageRank in the millions. With base 5, for instance, the toolbar PageRank would represent a true PageRank. The maximum possible PageRank, and thus this scale, continually changes as Google recalculates PageRank. 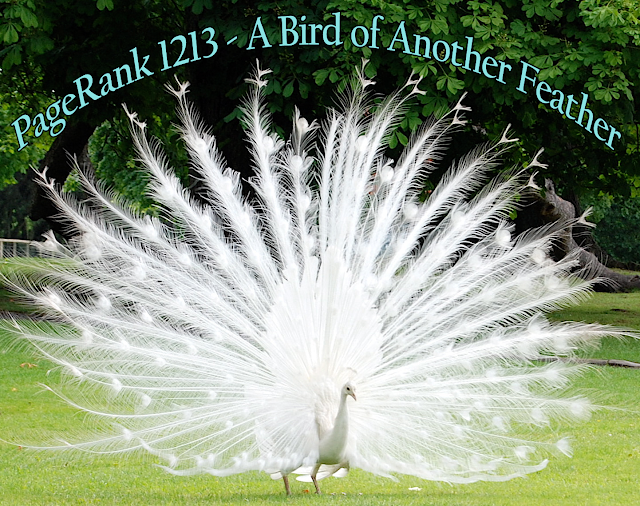 As pages are added to the index, the PageRank has to go up. Periodically, Google recalculates PageRank web-wide, and PageRank drops for many sites, perhaps most. And this last quote best explains my observation of what has gone on with the PageRank 1213 Update. The World Wide Web has billions of links being added daily, so periodically Google's "fine-grained notions of PageRank" as Matt putts it, become too high a number to convert meaningfully over to the PR Toolbar scale. This outdated PageRank table shows what previously were quantities of links required to receive desired target on the rank scale. Remember December 31st, --99? After which there appeared a mysterious surplus of guns & gas cans on the market in Texas. Well, without a recalibration, changing of the base number, or otherwise updating the Toolbar feed, one could assume that we might run into a Y2K of the Google PR Toolbar. In other words, it may of itself cease to calculate meaningfully without manual attention. While it could be as simple as just changing the base number, I'm also wondering out loud here if there was more to it than that, because of all the major changes to the Google algorithms. If then the PR Toolbar algorithm needed a rewrite to be compatible with other latest Google algorithms &/or to adjust the feed to the most recent actual PageRank conditions, I can imagine one might refer to this as "the pipeline broke," or maybe "the pipeline got blocked." Anyway, regardless of the theories, the reason I've brought up this discussion is, because many people have noticed that their PageRanks have dropped, with some experts observing that over 2 thirds of websites may have reduced ranking. But if we understand that the base number by which the Toolbar's logarithmic scale is calculated was most probably reduced, then we can see that these site's have not lost PageRank at all, the recalibrated Toolbar value just shows a lower number. With all that speculating out of the way, let's hear what Matt Cutts has specifically had to say about how the PageRank updates work. Again I would like to point out, Matt's continued reference to the purpose of PageRank being to show "how reputable a page is." PageRank is Google's opinion about how reputable a page is. It's something that is typically computed continuously. We have a bank of machines that's always looking at new links that we discovered are in the crawl, continuously updating. So we have very fine-grained notions of PageRank within Google. But for the most part, the process runs with very little human intervention. People don't really need to oversee things. We do still reserve the right, because it is our opinion of the reputation of a page that... For example, if a page is selling links that pass PageRank, then we might lower the Toolbar PageRank, things like that. So again PageRank is our opinion of the reputation of the page. It includes not only the links to your page, but how important those links are. And then we do that by having a massive amount of computation that sort of says, across the entire web, try to figure out which pages are the most reputable, and then that typically comes out every three or four months. 4. PageRank is "always updating, it's continuous & continual." Matt Cutts at Pubcon 2013, on how PageRank is "always updating, it's continuous & continual, & every single day we have new PageRanks. A lot of people ask, when are we gonna get the next PageRank update, I'll just give you the skinny right now. We have our own internal version of PageRank, it's always updating, it's continous and continual, and every single day we have new PageRanks. Then there's also an export that says, "OK, given our internal PageRanks, export that to the Google Toolbar. And normally it runs once every 3 months, or so, maybe every 3, or 4 months. A while ago, like earlier this year, that pipeline broke & we were kind of like, "You know people get a little too obsessed with that anyway, maybe it's OK to just leave that for a little while." So we don't have anybody staffed on trying to revive that pipeline, and we don't want people to get too obsessed about PageRank and so we're probably not gonna update PageRank throughout the rest of the year and then we'll see whether anything happens in 2014. Looking at numerous news and blog pages, I've whittled down this last PR Toolbar Update to covering only up to the first week of September 2013. That means any pages, or websites created after about Sept 3, 2013, will not show any rank at all. From which one might also assume that all the PR which is showing, had to have been acquired before that time, but that isn't necessarily so. Most of the past Toolbar updates have shown considerable lag between the time rank appeared & the time new pages were created. One theory I have for this, would be confirmation recrawls. And that is important because of some important ideas I'm going to cover in Part 2 of this series. So don't miss Part 2 coming soon, in which I'm going to uncover my latest juicy discoveries on Google Plus SEO & many specific details on PageRank changes throughout Google+ & the useful knowledge we can gain from this wealth of new data.